Proverbs 3:5 is one of my favorite verses: “Trust in the Lord with all your heart and lean not on your own understanding.” I say it multiple times a day. 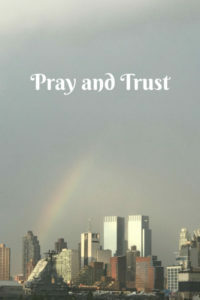 Because trust and prayer go together like all those things listed above. If we pray and say, “we trust you, Lord” then we can’t worry because worry and trust are not compatible. We want to trust. We mean it when we say it. But actually doing it and not taking matters into our own hands is hard to do, isn’t it? We can’t lean on our own understanding, as the verse says, because God does things bigger than we can understand. We moved our youngest daughter to South Bend Sunday for her to start her final internship at Notre Dame in the Athletic Department in Events Management. (Her undergrad degree is Public Relations and Sports Information and her graduate degree is Sports Administration). This is her dream job. She loves ND. She loves media and events management and dressing up for events. She loves women’s basketball which will be one of her main sports for her internship. We prayed for this and God answered. We were so excited. We found the perfect apartment that was close to campus and allowed half-year leases. Even though it’s not directly associated with the local colleges, most all the residents are college students and the apartment pairs you with roommates. The apartment sales lady, who was leaving in 2 days to go to another affiliated apartment complex in Texas (should have been a red flag), gave Morgan her future roommates’ names and phone numbers (which we later learned was a breach of privacy violation on the sales person’s part). Long story short, when Morgan texted them the Monday before move-in, things didn’t seem right. They didn’t answer for 2 days and when they did it was just… weird. Something wasn’t right. We began praying and soliciting our friends to pray. What do we do? Do we break a lease and pay a penalty and try to find another apartment? Do we contact the apartment complex and ask to be changed 3 days before she moves in? Or do we just go with it and pray it all works out? We didn’t know what to do because this is her dream job and we weren’t going to let it be a bad experience. And in true God of the Universe fashion, He did. The roommates called the complex the Thursday before Sunday move-in day. They told the manager they couldn’t live with Morgan because of a conflict with Morgan’s position in the athletic department and one of the girl’s job in the same department, different sport. The apartment complex called Morgan in a panic to see if this was a real conflict. Ironically, it was the same day God so strongly told me to trust Him. Morgan had no idea and even her boss hadn’t heard of such a thing. But it didn’t matter. God led the apartment complex to move Morgan into a different apartment with 2 girls who didn’t go to ND but to other local colleges just in case the original claim of conflict was real. We love the one roommate who has moved in so far! And I have no doubt the other one was hand-picked by God as well. God told me to trust and let it go and let Him work. I felt His presence so strongly in my prayers over this matter. I could never have come up with the details of this crazy plan. But His ways are beyond my understanding…. and I love it! You see, Morgan also wanted to get a cat and we told her she should wait until after this internship. But God cared enough to not only give her a roommate who cares but included a cat for good measure! Why do we doubt? He is so good. Our challenge over the next couple of days is to pray and trust. When things don’t work out the way we think is right, just wait. Trust. When we want to jump in and make it work out to our liking, just trust. If God tells us to do something, then obviously move. But while we are waiting, just trust. Pray and trust. It goes together like a lock and key; east and west; love and Jesus. This entry was posted on August 14, 2018 with tags: #prayerchallenge by Deanna Young.